A few days ago, I overheard Otis Redding singing from the speakers of a car near me, and just as suddenly, it dissolved into a rap. It actually made me go home and listen to a bunch of my Otis Redding tracks, including this most famous one. His voice gives me goosebumps, like a beautiful whisper from the past. I love glimpses of the past that shows people doing things that people still do today. 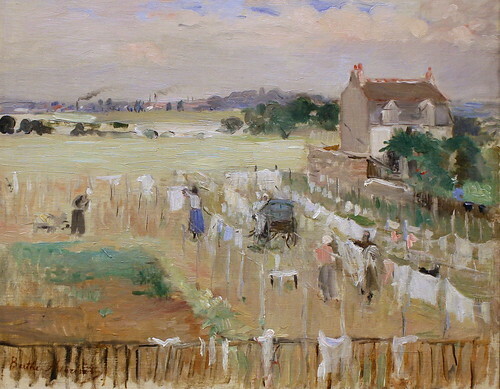 Morisot has a wonderful touch here, capturing the essence and flow of what’s happening below. I’ve been using this tool in my personal email account and, I’ve got to say, I’m inpressed. It’s made it really convenient to keep track of people I contact regularly – in other words, the key people in my life. Xobni automatically syncs up your emails from people with their postings on social networks and also grabs all of their contact information without you having to do a thing. It’s not perfect, but it works so well – and is so effortless in what it does do – that I’m incredibly glad to have found it. Adam Osborne spells out why I’d rather hire a “B” student or a “C” student with an interesting and varied resume than an “A” student with nothing but a perfect GPA. This quote really resonated with me recently. It doesn’t matter what you do. If you do something with any degree of success, you are never going to be able to please everyone. Instead, decide who you are going to please and focus on them wholeheartedly and don’t spend much time worrying about the rest. Companies and people and organizations that succeed are ones that are still connected to what actually matters to everyday people. If you don’t have any connection to the life of Joe Average, how can you expect to have job security or everything else? It’s an interesting way to look at the entire world. I wish everyone in the world did this more often. I’m often frustrated by discussions that are little more than insults tossed around and criticism that doesn’t consider the positives of what’s presented. Both are useless, and yet both get attention. One of the topics in history that I find fascinating are world’s fairs, particularly the 1893 one in Chicago that saw the public debut of electricity, the incandescent light bulb, and the Ferris wheel. This is just a wonderful shot of the Ferris wheel above the fairgrounds. This is for a reader going through a rough time. You’re a greater person than you think. If you want to succeed, find ways to help others and don’t worry about what’s in it for you. If you come at it from a “me first” approach, you’ll never succeed. Don’t worry about what’s in it for you if you want to find success.